Learning to ride a bike is a childhood rite of passage. The falls and scrapes are all worth it in the end when you are finally able to ride free with the wind in your face and your worries at your back. For a kid a bike is freedom. It’s the greatest form of personal transportation until you get your driver’s license. But the process of learning can be challenging and scary. Thankfully Schwinn and Toys”R”Us are here to help. Schwinn knows a little something about bikes, established in 1895, Schwinn is the go-to resource for the recreational bike rider. And I’ll admit I am a Schwinn guy. Christmas morning circa 1987 I came downstairs and saw the most amazing gift I’ve ever laid my eyes on. A yellow Schwinn with angel handlebars and a huge banana seat. I didn’t know what to do with myself. I was the envy of the neighborhood. I wish dearly I still had that bike. That is probably my single greatest Christmas present as a child. Just take a moment to gaze upon the greatness of that bike. Needless to say, from that moment on, I was a Schwinn fan for life. So when I had the opportunity to share that Schwinn legacy with my kids, I jumped on it. My kids are constantly asking me to go ride bikes and with 5 kids they are in all stages of learning to ride. The first step in learning to ride is to get a bike that is properly proportioned to your child. 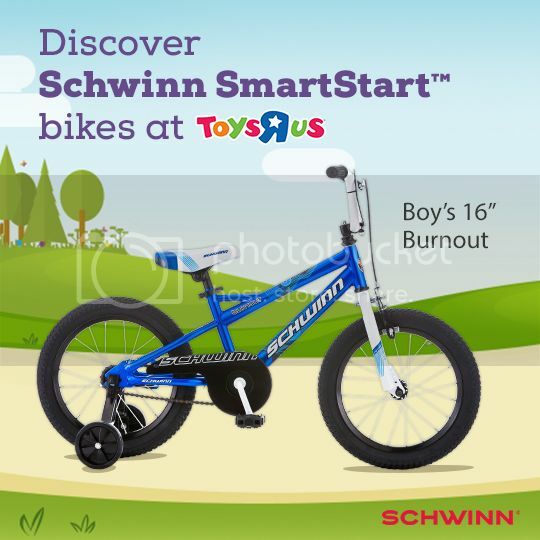 Schwinn has several SmartStart bikes specifically designed for kids. Not only do they come with colors and graphics that look amazing, but they have hidden benefits that will make it easier for little bodies to pedal and ride. The grips are smaller, the pedals are closer together, and the seat is angled in such a way that the body is positioned to make pedaling less stressful. If your child is more comfortable, then they will want to ride, and learning will be less frustrating for everyone involved. Plus, you can’t loose with the Schwinn name, since it is backed with a limited lifetime warranty for as long as you own the bike. We went with the Schwinn Burnout 16 Inch bike. Toys”R”Us has the largest selection of 16 inch bikes for kids and their friendly staff can help fit your child with the perfect bike. And of course, don’t forget the helmet! Toys”R”Us has a great selection of helmets too. My son was loving his new bike. We adjusted the seat so his legs were slightly bent when the pedals were at their lowest point. He has been without training wheels for a little bit with his old bike but he is still quite wobbly and unsure of himself. The Schwinn Burnout is specifically designed to be safer by reducing wobble. It didn’t take long and he was up and riding comfortably on his new bike. For those of you with youngsters just starting to learn how to ride a bike, here are a few pointers to help make that transition more smooth. And if all this greatness wasn’t enough, Schwinn is hosting a sweepstakes. Enter below for your chance to win a $400 family Fun Ride Prize Pack. Now get out there and teach your kid how to ride with confidence! Previous PostSix Pack Fitness, The Envy of all SAHDsNext PostMr 200. The Blogger Who Sold Out. Thanks for sharing! My daughter has refused to try riding her bike again after some falls. I’m going to use your tips with her next Saturday. Your son is really cute, and he really looks so happy in those pictures. 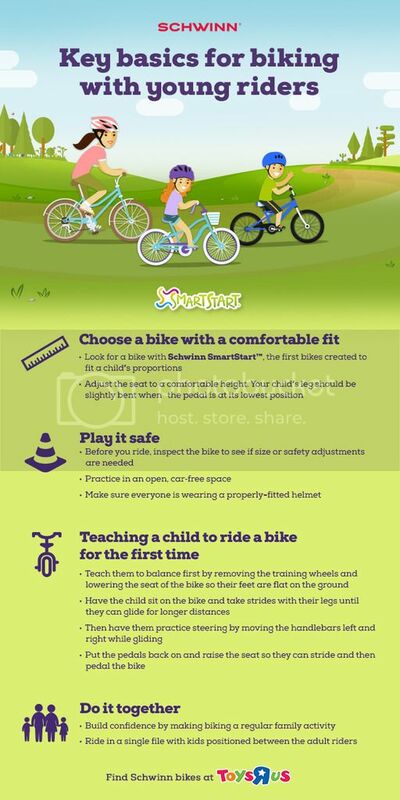 Thanks for sharing this infographic from Schwinn, I will keep these pointers in mind when it’s time for my little one to learn to ride a bike. Thanks!